If you want to sample one of Mitsubishi’s best-priced Tritons ever (and a suitably compliant tow vehicle to boot) you best get your skates on. As far as bottom lines go, the one on the Mitsubishi Triton GLX-R’s specification box is rather effective. That $31,990 (plus ORC) entry price is a healthy headline for a double-cab ute that certainly doesn’t scrimp on the good stuff. If you’re after a 2WD ute, then about the biggest compromise you have to get your head around with this one is the six-speed manual transmission. With auto ’boxes proliferating in all but trade-spec models from most manufacturers these days, a self-shifter has actually become something of a novelty to drive out of the showroom. The Triton GLX-R is no less capable for it though, and many will enjoy the extra sense of control a good old-fashioned manual provides. Additionally, this special model – it’s only on offer in this particular state of dress until June, so you better get cracking if it appeals – features standard hands-free Bluetooth phone and audio streaming connectivity, accessed either via the buttons on the leather-clad steering wheel or through the six-inch touchscreen display in the centre console that doubles as the colour monitor for the standard reversing camera. The Triton GLX-R also boasts keyless entry, tinted privacy glass, running boards and sporty 17-inch alloy wheels. 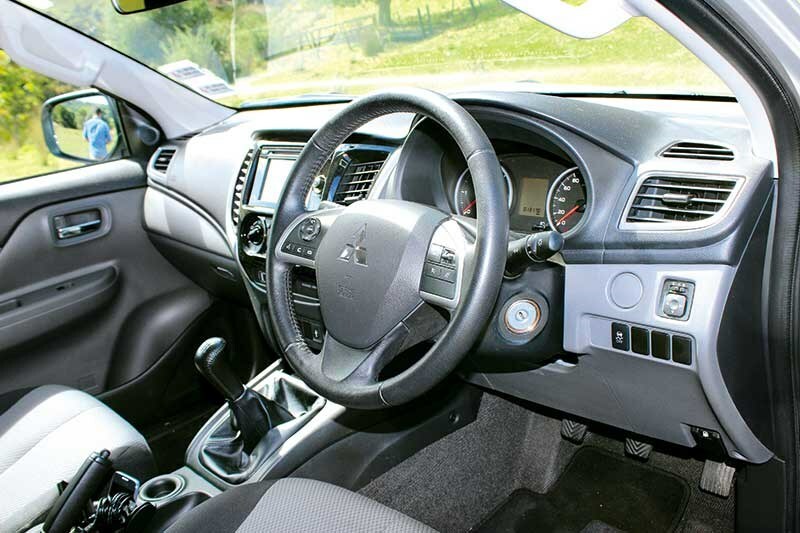 One of the more important features is Mitsubishi’s Reinforced Impact Safety Evolution (RISE) body design. 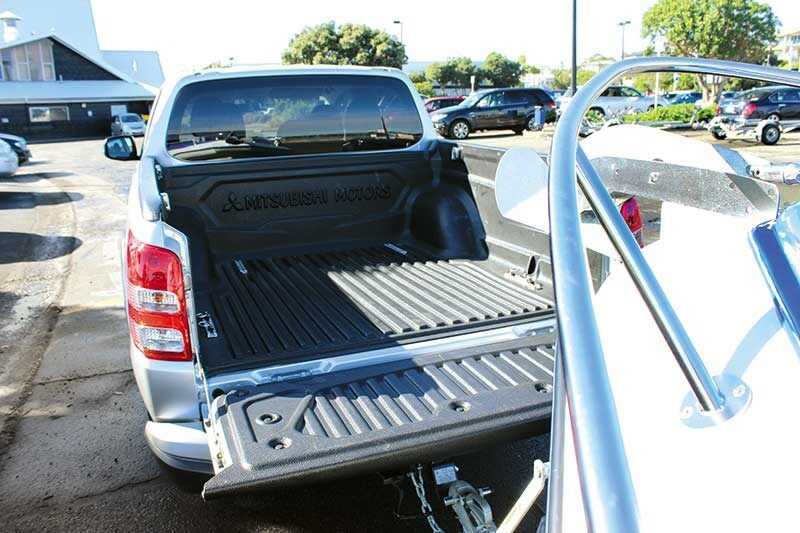 This ensures the cabin area of the ute maintains its shape in the event of a crash, transferring energy away from the passenger cell but this added stiffness also helps make for a more settled and compliant on-road experience too, regardless of what’s in the tray or being towed behind. 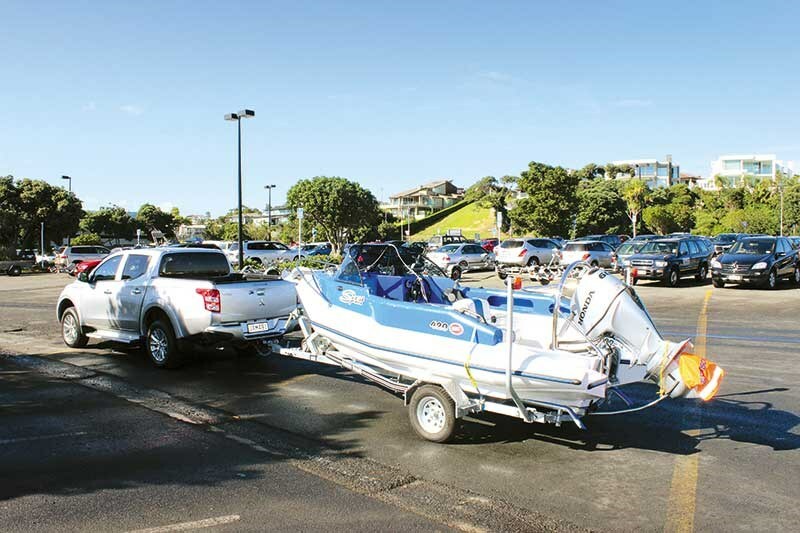 So, a dependable ute – matched with a dependable boat? The compact craft we hooked up to the Triton for our test was the popular MAC 420 Sport, a highly capable 4.2m family boat that has proven its credentials beyond mere weekend fun. The Coastguard Northern Region uses the MAC 420 Sport as its training boat for Day Skipper certificate students, and if that’s not a vote of confidence in the dependability, buoyancy and predictable handling of this boat, then I’m not sure what is. Much like the Mitsubishi towing it, the New Zealand-made MAC Boats are all about structural integrity. They use a unique pontoon manufacturing process in which the inner and outer hulls are bonded together in one piece along each beam from bow to stern. This ensures an impressive level of rigidity in the hull, along with the sort of stability – even in rough weather – that has made this Auckland-headquartered company’s models a popular choice for dive schools and commercial enterprises around New Zealand and the South Pacific. MAC Boats is a great success story out of the local New Zealand marine industry and it was nice to have a well-specified example in the 420 Sport along for our test. Despite its size, this model features an impressive line-up of standard equipment. 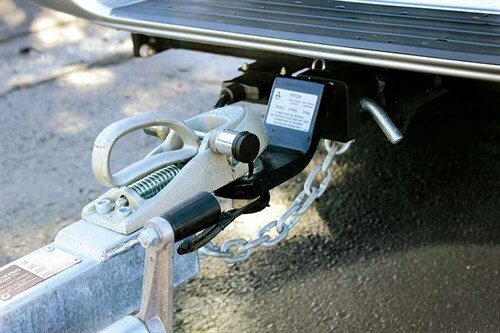 Items such as an integrated fender strip, outboard bracket, towing eye, anchor cleat and hatch, grab handles, pedestal back-to-back seats, a pair of rod holders and a walk-through screen are all out-of-the-box items. With an external beam of 2.2m and 1.7m internal, the MAC 420 Sport will seat five and makes for a good family cruiser, with its high sides giving a bit of extra reassurance if the weather turns foul. 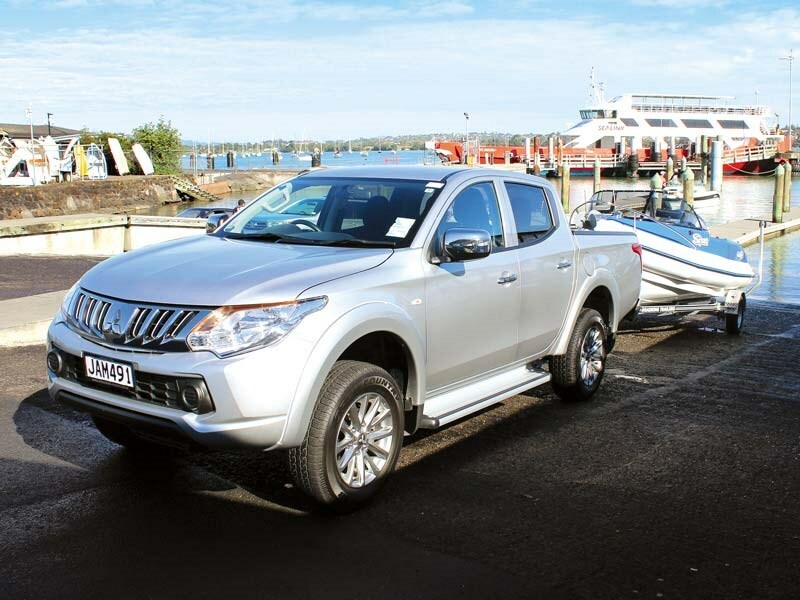 The 420’s hull weight of 375kg is decidedly on the light side, and even though this particular example has a few extras on it – as well as a 60hp Honda outboard – a compact boat like this on its single-axle trailer definitely isn’t going to give the three-tonne (braked) towing rating on the Triton any concerns. Heavy traffic at the end of the Easter weekend could have made the boat ramp-bound commute (even though it’s a relatively short one for me) a bit of a headache. But with a good line of sight from the Triton’s large external mirrors back along both sides of the boat and a short follow-around from the trailer mitigating the need to turn especially wide through intersections, the cruise to my stepping-off point was admirably easy. 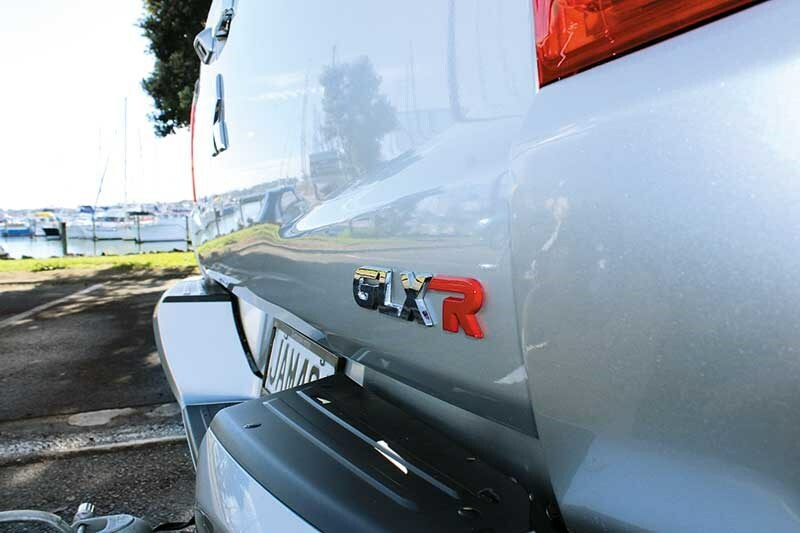 Backing down the ramp was straightforward too, thanks to the Triton GLX-R’s standard reversing camera. Keeping a judicious eye on both mirrors is a hard habit to break but having the extra failsafe of a view from the drawbar is something that quickly becomes equally hard to give up once you’ve got it. We’d seriously underestimated the amount of traffic on the ramp as Aucklanders made the most of a short working week too, so getting the boat down to the waterline at an unfamiliar ramp in a timely fashion was crucial as other boaties waited their turn; the Triton’s reversing camera certainly came in handy for minimising the risk of ramp-rage! More than this, it’s great to see manufacturers finally adding reversing cameras to wellside tray-fitted utes. As machines like the Triton grow in size generationally – and as they’re commonly used these days as hybrids for daily work use and weekend family transport – proximity sensors and reversing cameras have rapidly become necessary items rather that luxuries. The Triton’s tray has generous interior dimensions – 1520mm long by 1470mm wide – meaning it’s great for carting all your bulky gear around but the flipside is it’s something to be considered for a host of other reasons when reversing out of that tight supermarket parking spot. That all new Tritons fitted with wellside trays feature a reversing camera is admirable. Other standard safety kit on the five-star ANCAP safety-rated Triton GLX-R includes a suite of seven airbags, ABS and Electronic Brake Distribution and three-point retractable seatbelts for all five seating positions. Also worthy of note is the Trailer Stability Assist. This clever system applies the brake to the appropriate wheel and adjusts engine power in order to stabilise any sway motion. That wasn’t an issue for us in Auckland’s heavy traffic but certainly is something that would provide a degree of reassurance for longer trips at highway speeds out of town. On the road with the MAC 420 Sport behind, there was no shunt or push from the trailer. While the Triton’s turbo diesel doesn’t hit its meaty maximum torque figure of 437Nm until about 2500rpm, it offers up spades of torque from much lower in the rev range. In practice, this means that smooth take-offs and a noticeable lack of need to change down to lower gears are the order of the day. I’ll admit that it’s been a while since I drove a tow ute with a manual transmission but the Triton maintained impeccable manners throughout the entire exercise; even the reasonably steep access road away from our ramp of choice was dispensed with sans fuss and drama. The standard Hill Start Assist feature – which momentarily brakes the ute when starting off on an incline – helps make everything that much smoother with a load on the towball too. 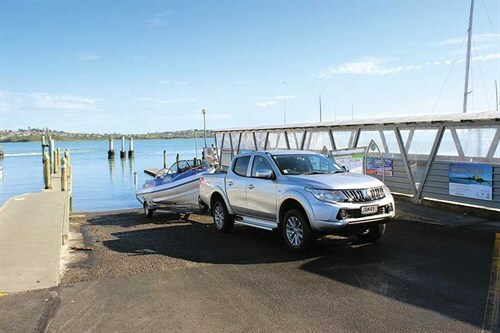 A bit like the MAC 420 Sport hooked to the back, the Mitsubishi Triton GLX-R feels like it’s all about ease-of-use. It proved to be a powerful front-driver with just the right mix of do-it-yourself simplicity and superior modern technology on board to make it an impressively packaged budget-friendly workhorse and a worthy tow vehicle too. For the latest boating news, subscribe to Trade-A-Boat magazine here.